Dark Souls is a dark fantasy action adventure role playing game from Japanese game studio From Software. It is one of my most anticipated titles of the year and I am still enjoying it after dieing dozens and dozens of times. I’ve wanted to buy the Japanese version while in Japan but all my money evaporated by the time the launch date came around and I was unable to buy it until I returned to Jamaica. I borrowed a Playstation 3 from a friend played it almost non-stop for the last week of my vacation from work but since resuming work and exiting bum mode I have found playing time increasingly difficult to come by, even on weekends. I have clocked up about 100 hours so far on my first play-through and I am about 3/4 of the way through. This game is the hardest, most unforgiving game I have ever played. It has resulted in many a sleepless night and may have been indirectly responsible for the death of a PS3 controller I was using after causing me to explode in a hulk-like rage. Dark Souls to me is special as it reminds me so much of the old days when gaming wasn’t watered down and spoon fed to the player. There is no direct play by play story just a wicked cool intro that ends with the player in a cell and an open world to explore and discover while trying not die at the hands of the myriad of foul creatures lurking around every corner. In Dark souls you play as a chosen undead, you go around murdering bosses with your weapon of choice. Though at the begining you choose a “class” you are not tied into a generic path of leveling like most games and instead can mold a character that truly reflects your playstyle with advantages and of course disadvantages. This game is only for mature players, check out the epic trailer below. I started out playing as a female thief with an affinity for ranged weapons, my character soon evolved into what I can best describe as a swift, fire throwing, spear wielding trickster. I am hoping to finish the rest of this game this coming weekend and play through again as a spell-caster and record some interesting videos for my Youtube channel. Fan of super hard, super long, mature RPGs? Dark Souls is the game for you! 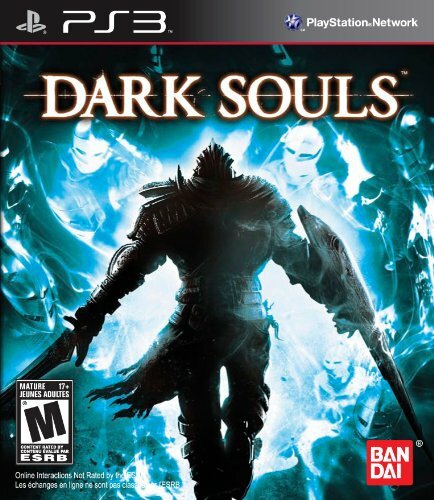 Pick up Dark Souls on Amazon for the Playstation 3 or Xbox 360 and “Prepare to Die”… seriously. Been playing this myself, though I recently took a break. Fun in a somewhat masochistic way. Harkens back to the (NES) days when you’d have to die and replay a level a million times to beat a game. Where int he game are you now? I am absolutely suffering in the Tomb of Giants, Gravelord Nito is my next target. Haven’t been playing a ton lately…a little hard to say because you can do things in different orders, but I beat the Anor Londo boss and haven’t really progressed a whole lot further yet. Died in the Tomb of Giants and haven’t gone back yet, though I recently got the light spell so I may.